Attend Disney’s Information Session & Learning Workshop, hosted by their Accounting & Finance Rotation Program. During the presentations, they will be sharing full-time and internship opportunities at Disney and a McCombs alum will be presenting on Disney’s new streaming service. Session will be held on March 5 in UTC 3.102 from 5:30 – 6:30 p.m. No RSVPs required. 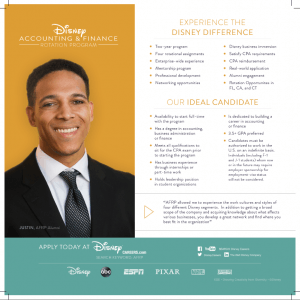 The Disney Accounting & Finance Rotation Program is a full-time entry-level program designed to provide recent college graduates a cross-functional, enterprise-wide learning experience within the Accounting, Audit and Finance departments at The Walt Disney Company. The goal of the program is to create a pipeline of future leaders for the company and to assist participants in becoming licensed CPAs.